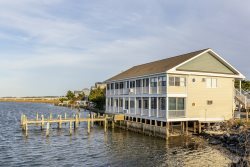 Seaside Vacations is licensed and insured as a Real Estate Brokerage as well as a Professional Property Management Company, providing Real Estate Services in both Maryland and Virginia. Our focus is providing the best customer service experience possible for both our Guests and Partners. Meet the Top Realtors in Chincoteague and Captains Cove, VA! Our founder, Lance Stitcher, is a licensed Real Estate Broker, and Elaine is a Licensed Realtor in Virginia. We cover the entire Eastern Shore of Virginia and Worcester and Somerset Counties in Maryland. Visit our website at ESVAHomes.com to search for your dream home. Let Seaside Vacations show you just how affordable ESVA living can be. Whether you are looking to buy or sell, Lance & Elaine would be happy to discuss your needs and offer input as to how we may best represent you. We like to help our clients and make sure that whether entering the Eastern Shore Real Estate market as a primary residence, second home, or Vacation Rental Owner, or exiting the market, that you receive the best service possible. Dreaming of owning a Vacation Home and wondering if it is possible to subsidize it by putting it in our Vacation Rental Program? We have many Partners who have made their dreams come true doing just that! We are more than happy to discuss this with you, and will provide Rental Income Projection Sheets for any properties you may consider - even if we aren't the Broker you are using. We look forward to serving all of your Real Estate needs here on the beautiful Eastern Shores of Virginia and Maryland! What do our Buyers & Sellers have to say about us? "If you are thinking about selling or buying a home, we highly recommend Lance Stitcher and the Seaside Team! We called Lance when we decided to sell our home on the Eastern Shore of Virginia. On our first meeting with Lance, he spent time answering all our questions, providing objective data regarding how many homes were for sale in the area, how long their listings typically stay on the market, and provided information on comps in the area. Lance’s marketing strategy and available tools were excellent. Our listing included not only professional photographs but also an incredible 3D guided tour that was amazing! His hard work and real estate knowledge stood out. Along with his expertise of the real estate market, all of our phone calls, emails, or texts were answered promptly. We were also kept informed of all feedback from showings. Our house went under contract within 3 weeks of having it listed. Once the offer was accepted, Lance walked us through every step of the closing process. Lance is a true professional and a genuinely nice person. We highly recommended Lance Stitcher and the Seaside Vacations' Real Estate Team to everyone!" Terri S.
"We would also highly recommend the Seaside team for your Eastern Shore real estate needs! As novices to the area, we were fortunate enough to have been referred to Lance Stitcher to help us find a home. Lance quickly responded to our initial contact to show a property, and was informative and knowledgeable in answering our million questions. Most impressive is that he listened to what we were looking for, assessed our needs/wants and recommended a property that was perfect for us. He creatively showed us what it would be like to live in the area which made it an easy decision to purchase this home. As we live out of the area, Lance continued to go out of his way to be helpful with each step of the purchase process. He suggested options and creative solutions to issues that came up and did not hesitate to inject badly needed humor during a few stressful moments. The entire staff was very helpful & extremely friendly from start to finish and we knew we had made a good decision. We are absolutely happy with our new home and would like to thank Lance and the Seaside team for making it happen!" Carol H.